I bought Control Unleashed about a year and a half ago, when my training had hit a wall and it seemed like nothing I did worked for very long, if at all. In my case, I was dealing with a rescue dog who had some wonderful accomplishments behind him, but he had developed some pretty intense phobias along with generalized anxiety which required that I give him a long break from flyball and agility while I figured out what to do, because clearly, what we were doing just wasn’t fun for either of us anymore. During this break from all dog sports, I delved into every book and dvd imaginable. The one book that changed my dog’s life the most was Control Unleashed, by Leslie McDevitt. I also found it of great benefit to watch Leslie’s DVDs: “Game Demonstrations-A Foundation Seminar” (4 DVD set), and “Control Unleashed- Game Demonstrations” (3 DVD set). Being able to read the book, then actually see Leslie work with dogs of various personalities, to observe the individual responses and nuances in the dogs’ body language, and to be able to observe the precise behavior Leslie was clicking for, was invaluable to me. These DVDs are available at Clean Run in many formats, from eBook to video on demand for individual exercises. Control Unleashed provides a series of structured exercises or “games” which you do with your dog. The exercises are simple and easy to learn, but surprisingly effective. 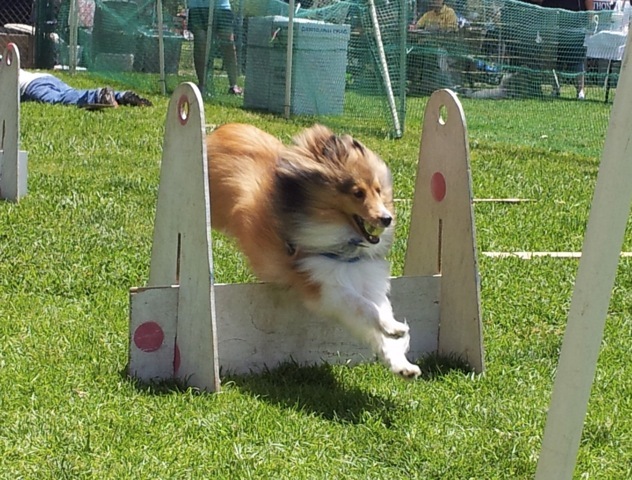 Dogs enjoy and respond to these games quickly, because they are fun and rewarding. They get totally absorbed in the game, deepening their connection to the trainer. In fact, when given the opportunity (in fact, told) to “take a break” from the game and be a dog (e.g., sniff the grass, check out that garbage can, etc. …) the dog often chooses to continue working instead. Why are these games so effective at creating a focused and confident dog? Well, for many reasons. First and foremost, they create a safe and predictable routine in which learning can take place. It is very critical that the dog is always doing the exercises and playing the games “below threshold”. This means that he is not barking, tucking tail, freezing, lunging, staring, stiff, or “locked onto” the object of his concern (aka the trigger) in any way. A good distance is where he notices the presence of the trigger, but it isn’t overly consuming his attention. Your dog still notices that you are alive and is able to work with you. He isn’t “zoning” or as Leslie McDevitt would say, “off riding the unicorns”. This is the perfect training distance. However, what is the perfect training distance one day may not be the perfect training distance the next day. The next important thing you must do is learn to “read” your dog. Kind of like when your best friend is able to look at you and say, “Something’s bothering you, isn’t it?” and you haven’t even said a word to them. They know what you normally look like when you are happy and relaxed, and they can recognize minute changes in your demeanor. We must learn to be keenly observant of our dogs’ body language, because only then can we honor the relationship, the team partnership, with our dog. And like any friendship, the more we respect each other’s needs, the closer we become. And truly, isn’t that what we all want? A close working partnership where our sports dog craves the mental stimulation and connection with us? The book is clearly written and easy to read. I found myself using many bookmarks, and referred to it over and over as I would work with my dog to learn a game, then move on to another one. Control Unleashed games are simple yet powerfully effective, and would make a valuable addition to anyone’s dog training shelf. Whether you want to get the most out of your performance dog or just deepen your relationship with your canine best friend, Control Unleashed is the way to go.